Bethany England scored twice as Chelsea defeated Arsenal for the second time in five weeks to reach the Women's FA Cup quarter-finals. Jonna Andersson also netted a spectacular long-range effort to help the home side reach the last eight. Chelsea won 2-1 at Arsenal in the Women's Super League on 13 January, having lost 5-0 at home to the Gunners when last hosting them in October. Emma Hayes' side, the cup holders, beat the Gunners 3-1 in last season's final. The winners of Sunday's ties will reach the last eight, with the draw live on Monday from 18:45 GMT on the BBC News Channel, the BBC Sport website and Connected TV. Chelsea took just five minutes to open the scoring as Arsenal squandered possession cheaply to Erin Cuthbert, who drove towards goal before squaring for England to finish from close range. Arsenal responded well with Kate McCabe hitting the post but it was 2-0 six minutes before half-time as Sweden international Andersson sent a 20-yard effort dipping under the crossbar. England wrapped it up on 58 minutes when she raced onto a flick-on and lashed a shot from just inside the penalty area into the top corner. 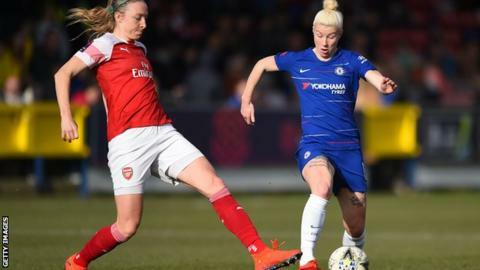 Arsenal missed a chance for a consolation goal when Chelsea goalkeeper Ann-Katrin Berger saved from Beth Mead but Fran Kirby was denied a fourth goal by a smart save from visiting goalkeeper Pauline Peyraud-Magnin.